Cynthia Lennon, John’s 1st. wife, passed away April 1, 2015 at the age of 75 after a battle with cancer. I’d always wanted to meet her and in 1994, I got my wish. Someone had told me of a Beatles’ Convention in Stamford , Connecticut and she was one of the main guests. 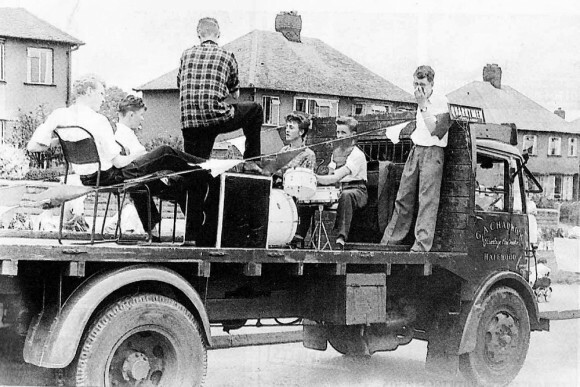 I had never been to a Beatles’ Convention before, but my fellow student and friend, Al Whyte, and I had just completed a course about putting on events and our two’s school project (only a fantasy) had been to do a Beatles’ Convention. So we had a chance to actually go to one and also meet, as I say, John Lennon’s wife. 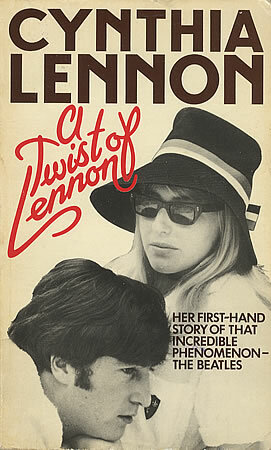 I had read her book, Twist of Lennon, and could picture what it must have been like before they were very well-known in those early Beatles’ days in Liverpool. Al and I met her briefly and she was even nicer and lovely than I had hoped. She signed my copy of her book and I nervously asked her some questions. I’d always wanted to see if I could try and see what John had been like past the pop star and media images. We also ran into her later coming down in the elevator of the hotel where the Convention was being held. She had long blonde hair and wore wire-rimmed glasses like John. I had read the romantic story in her book about how John had met her at their Liverpool art school in 1958. But they were complete opposites. John was the angry, chip-on his shoulder rebel, especially because his mother had been killed by a drunken driver when John was still a teenager. 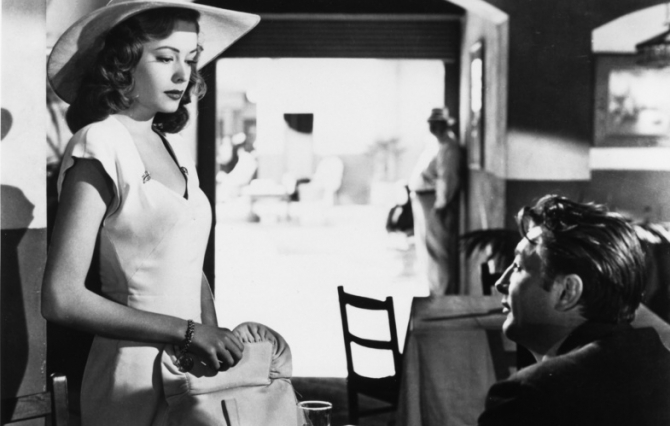 Cynthia Powell was the more middle-class “nice girl”. But what they had in common was both of them being near-sighted and their love of art. But she was able to detect underneath the Lennon sneer, a softer side too. They would sneak over to John’s aspiring-painter friend, Stu Sutcliffe’s room to make love. 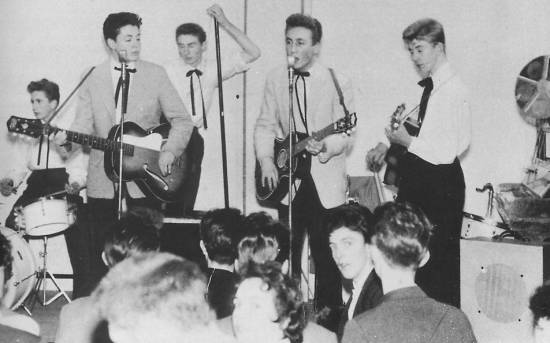 Cynthia was very supportive of John and his early budding Beatles’ band. And when Paul, George, Pete Best, and Stu Sutcliffe were sent to Hamburg, John would write back regular funny postcards and letters to her (even though they were playing in some of most decadent bars and temptations in Europe). When they returned from Germany and first played the Cavern, she was there too. But Cynthia didn’t have it easy. She was renting a room from John’s sometimes stern Aunt Mimi, while working at Woolworths and the two women didn’t get along. She then moved to a small bedsitter room. 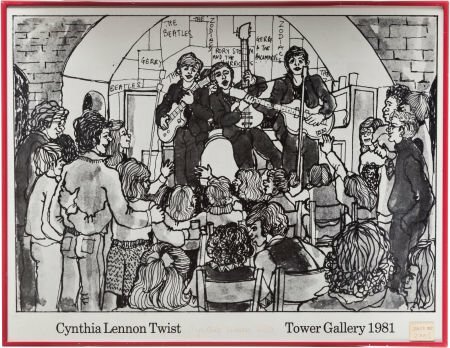 Cynthia Lennon’s own artwork of The Cavern days. At their height, as The Beatles were experimenting with drugs, Cynthia never really felt comfortable with their excesses. Beatle wives were rarely allowed to be in the studio when their husbands were at work. When their manager, Brian Epstein died, they all went to India to see the Maharishi, but John was secretly writing to this new artist, Yoko Ono. On the plane home, he admitted to his wife the many affairs he’d had. John advised her to go to Greece for a vacation, the day she returned, she discovered Yoko had spent the night with him at her home. Lennon and Cynthia soon divorced in 1968. John had remarried Yoko but Julian had been pretty well ignored by his father ( much as John himself has been deserted by his father). It wasn’t until Yoko and John had separated for several months in 1973 and John was with May Pang in L.A. that May encouraged John to re-connect with Julian. Interestingly, I also met May Pang at that same Conn. Convention. I was surprised she was there; she wasn’t a scheduled guest. But I soon learned she was good friends with Cynthia and had come in to see her. I was able to meet May Pang too and get her to sign my copy of Lennon’s Walls and Bridges album and get photos of her too. .Al and I were so inspired by meeting Cynthia and May Pang and others at that Conn. Convention that we decided to actually put on our own Beatles’ Conventions. Also, soon after I got back home, Stu Sutcliffe’s sister, Pauline called me from England (I think Cynthia must have given Pauline my number). We had presented Cynthia with our “fantasy”. She seemed interested in our more ‘artistic’ convention than they usually were. 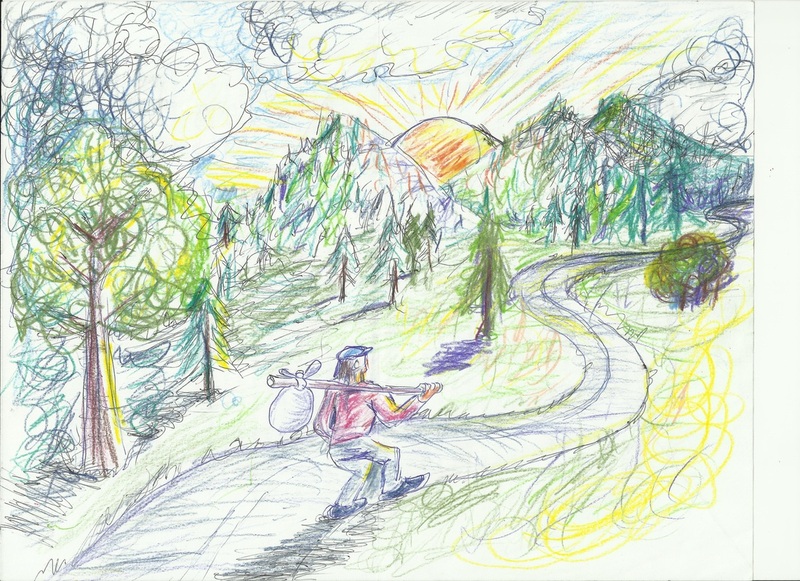 Cynthia was an artist in her own right and she would later have exhibitions of some of her art. Cynthia Lennon’s own artwork of The Cavern. Cynthia’s own drawing of The Cavern. We even thought of having her son, Julian, whom had had a successful album, Valotte, as a guest too (which she liked). 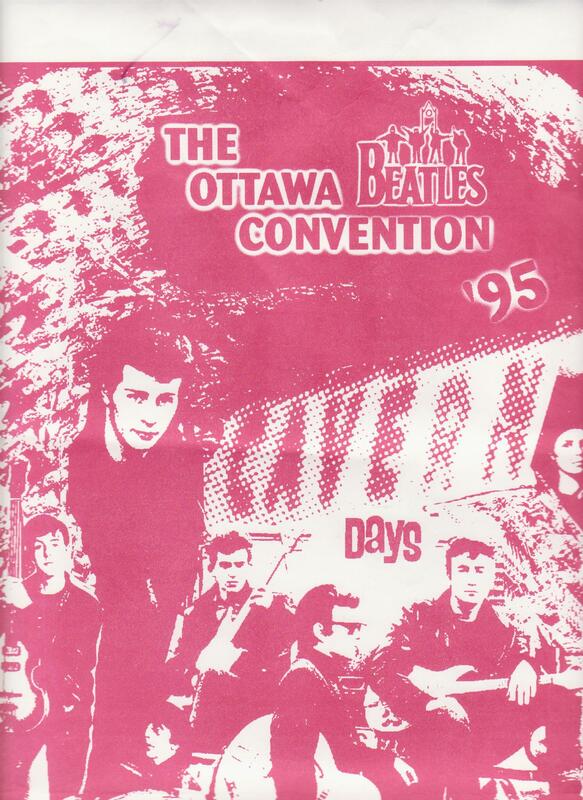 Unfortunately, she couldn’t make it, but we did end up doing our Ottawa Conventions in ‘95 and ’96, with Pete Best and Louise Harrison as main guests, respectively. Cynthia Lennon would later write a second book simply called John in 2005. She was a lot more critical of John in that book than her first and even said she wished in some ways, she had never met him. Cynthia would, for years, have trouble getting much money and ran a couple failed restaurants and two of her marriages had ended in divorce before her final third husband died in 2013. When Yoko inherited John’s estate when John was killed in 1980, it still took years until Julian finally got a settlement which he shared with his mother. Julian has been bitter the way he felt he had been treated, but over time, all the Beatles’ wives and children finally did appear together at certain functions such as the premiere of Cirque de Soleil’s Beatles’ Love show. Cynthia, despite having been married to one of the most famous people in the world, as I said, didn’t have it easy. But I was honored to meet her. I have no doubt that if Al and I hadn’t met Cynthia, we would never have actually done our own Beatles’ Conventions and gone on to meet several who knew The Beatles. That’s how much this lovely lady, Cynthia Lennon, had inspired me. This entry was posted in 1960's, John Lennon, Paul McCartney, pop culture, rock, The Beatles and tagged 1960's, Cynthia Lennon, John Lennon, Julian Lennon, May Pang, pop culture, Rock, THE BEATLES, Yoko Ono on April 2, 2015 by Alan L. Chrisman. 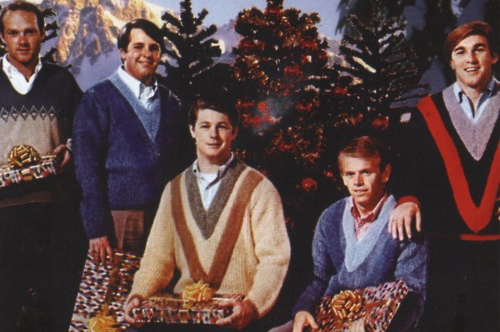 The Beach Boys Christmas Album is still a yuletide favorite. It combined The Beach Boys’ harmonies with traditional holiday standards, but Brian Wilson also wrote or co-wrote with Mike Love, five original songs about Christmas. The album was released in Nov. 1964. Their first original Xmas song, included on it, “Little Saint Nick”, had been recorded during their All Summer Long album sessions the previous summer. Reacting to The Beatles’ Invasion, Wilson was trying to expand his song writing and subjects past the just California beach boy culture. Something he would follow through with his landmark Pet Sounds album a couple years later in1966. “Little Saint Nick” had been a Christmas hit the year before, so Wilson decided to record a whole album of Christmas songs for the next holiday season . 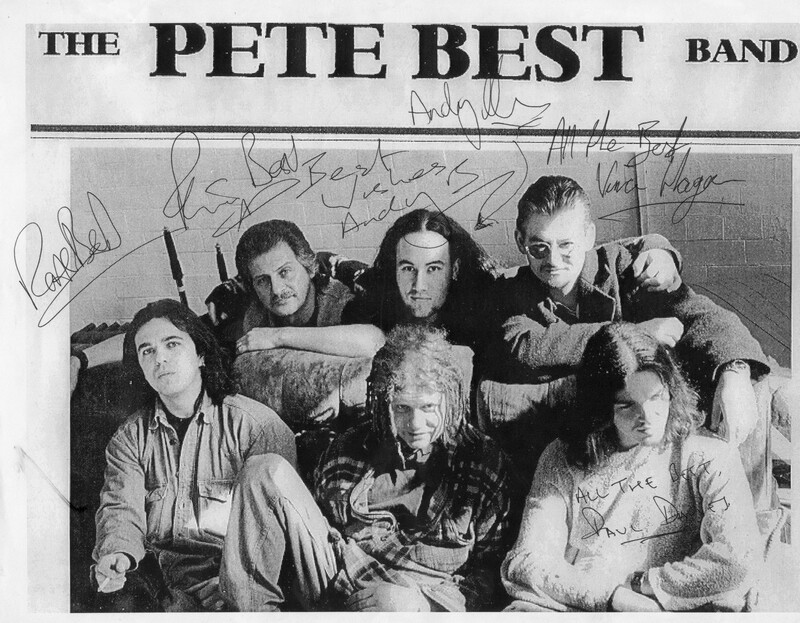 The song, has also too, especially, become a Xmas-rock classic and is similar in structure to their earlier released tune, “Little Deuce Coup”. For this album, he and Mike Love wrote four more originals for the first side: “The Man With All The Toys”, “Santa’s Beard”, “Merry Christmas Baby” and “Christmas Day”, as well as including, “Little Saint Nick”. The other five holiday standards on the second side are done Beach-Boy style. 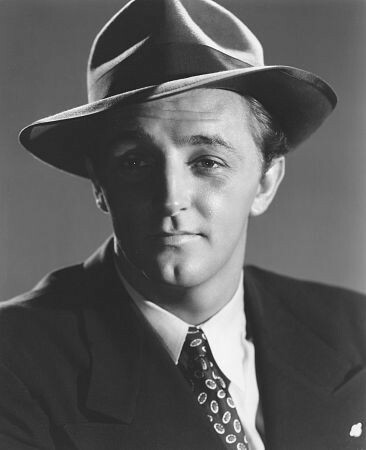 Wilson even sings solo on Irving Berlin’s White Christmas, and Al Jardine, for the first time, sings solo on the Wilson original, “Christmas Day”. They are also accompanied by a 40 piece orchestra, so it’s a winning combination of The Beach Boys’ sound and the traditional, which, as I say, has become a holiday pop classic. This entry was posted in 1960's, Music, pop culture, rock and tagged "Little Saint Nick", Beach Boys, Brian Wilson, california, Christmas, Hoilday, Pet Sounds, pop culture, Rock, surfing on December 13, 2014 by Alan L. Chrisman.